As I write, I am quite enjoying some time back home in Rockland, ME, visiting my mother. [12.04.16] - new piano piece..! I'm quite looking forward to working again with extraordinary pianist Laurence Cummings on a new work for piano. The piece will have its premier at Laurence's senior recital at Brooklyn College. Laurence was fantastic to work with when I wrote my Trio for clarinet/violin/piano, and I'm happy that he reached out to me about doing something. This piece has been a long time in the making; I've set it aside for periods, returned to it, set it aside again ad infinitum. Laurence's recital is sometime in May, date not yet set. Stay toont! On Tuesday 11/15, my sextet will perform for the second time, with Philip Dizack (trumpet) joining the band for the first time. The remaining personnel are the same from my Shapeshifter gig: [Kevin Sun (tenor saxophone), Patricia Brennan (vibraphone), Walter Stinson (bass), Paolo Cantarella (drums)] We will be performing brand new music, some of our old stuff, and some material from the canon. This will be our last performance until mid 2017. Don't miss it! I am currently writing for and rehearsing with a new trio with Dean Torrey (bass) and Xavier Hill (drums). The three of us started playing exploratory sessions in my apartment a couple of months ago, and our chemistry was apparent immediately. My goal with this group is to explore my more idiosyncratic tendencies as a pianist and to reimagine the possibilities of the piano-trio format. 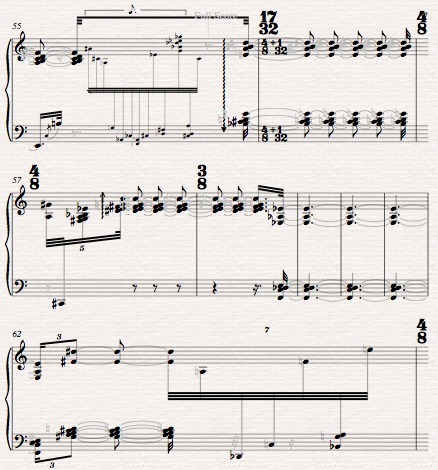 My initial idea was to capture the looseness/rawness that I associate with chord-less trios, where the absence of clearly delineated harmony lends itself to a more open-ended sort of energy. The bass and drums in this trio do not fulfill a "supportive" role to showcase my playing; instead, they form an ever-shifting rhythmic and textural foundation, such that I am able to be subsumed into an amorphous space, or to play against it. As I write more and workshop more with the group, my ideas will come into sharper relief. I anticipate that our first performance will happen in February or March of 2017 (stay tuned).